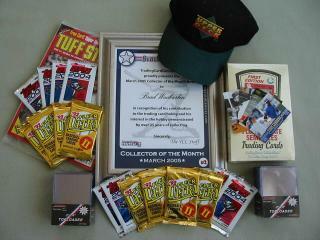 Congratulations to Brad Wackerlin of Lake in the Hills, IL for being named as the March 2005 Collector of the Month! Brad has been collecting trading cards ever since he bought his first pack of Topps baseball cards in 1980 when he was just 8. For over 25 years, he has collected baseball and hockey cards. As a lifelong Cubs fan, he grew up idolizing Ryne Sandberg, Andre Dawson and Mark Grace. However, Grace has been Brad's favorite player ever since he came up as a rookie in 1988. Why? According to Brad, "Mark Grace was a throwback, 'old-school' player. He played the game the old-fashioned way and gave it his all. He was consistency defined: an above .300 average, gold-glove defense and a dirty uniform all were staples of his game." Nowadays, card companies and their various sets come and go each year. There simply is no way to collect everything. 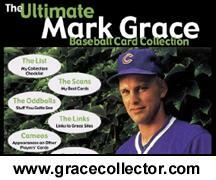 Combining his admiration of Grace with this understanding, Brad began to focus on collecting Mark Grace cards. By specializing his collecting, he was able to see the set designs for everything that was available, but only had to buy one card from each set. Of course, he went for all the Grace inserts too - making the task tougher. Today, Brad's claim to fame is having the ultimate Mark Grace baseball card collection. With over 2000 different cards including 31 different 1/1 cards, 177 different memorabilia cards and 64 different certified autograph cards, Brad is certain that he has the world's most complete Mark Grace collection and is known by many as the "Ultimate Mark Grace Collector." So with a player collection of that size, does Brad have any favorite cards? According to him, his favorite is a 2003 Leaf Limited Threads Button card that features a game-worn swatch of jersey with an actual button from Mark Grace's uniform. Only 6 of these cards were made. In addition, his favorite piece of memorabilia is a prototype first baseman's mitt made for the Walt Disney company and Mark Grace when the Disney company was considering launching its own line of sporting goods. Only two of these mitts were made - one was given to Mark to keep and Brad has the other. Being a graphic designer by trade, Brad has used his professional experience in web design to build sites that let him share his collections with the entire community of sports card collectors. 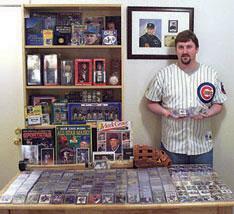 He created The Ultimate Mark Grace Baseball Card Collection (GraceCollector.com) web site to showcase his extensive Grace card collection. 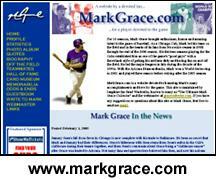 In addition, he runs the MarkGrace.com web site which provides information and updates on Grace. Both sites help to educate and entertain collectors about Mark Grace and the many different Grace cards that are available. Brad noted, "Many collectors write to me and are grateful that I take the time and effort to create web sites where they can look at rare cards that otherwise they would never be able to see." 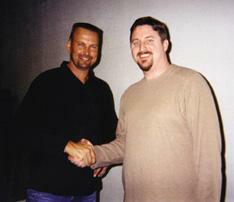 In the fall of 2003, Brad had the opportunity to meet Mark Grace at a private autograph signing in Arizona. Brad recalls the meeting by saying, "I took great pride to hear him say that he had seen my sites and found them flattering. He signed five items for me including my prototype mitt and they are all treasured items. This once-in-a-lifetime opportunity to meet my sports hero made all the effort I put into maintaining the web sites seem worthwhile." In addition to Mark Grace, Brad also collects Mats Sundin game-used and certified autograph hockey cards, certified autograph cards of Chicago Cubs legends and complete Topps baseball, football, hockey and basketball sets from 1972 - the year he was born. 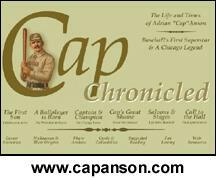 He's also developed an interest in tobacco-era cards, especially of Cap Anson which helps explain one of his latest web sites, CapAnson.com. 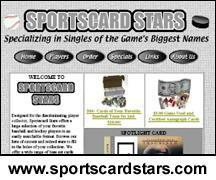 With over 100,000 "extra" baseball cards, Brad also runs an online sports card store, Sportscard Stars, to help collectors fill the holes in their own collections. As the ultimate player collector, what do you do after your favorite player retires? Beyond his own additional collecting interests and the fact that retired players are now routinely featured in new sets, Brad replied, "My wife Amy and I were blessed with our first child in 2004, my son Connor. I look forward to seeing who he picks as his favorite player and helping him start a collection." To his fellow collectors, Brad said, "I encourage you to visit GraceCollector.com for yourself and see my collection. Please feel free to contact me via my web sites if you have any questions or comments about Mark Grace or collecting sports cards." He then added, "I'm a big fan of TradingCardCentral.com! I use TCC to keep up to date about the latest card releases and what's going on in the hobby. Thanks TCC for making me your March 2005 Collector of the Month!"